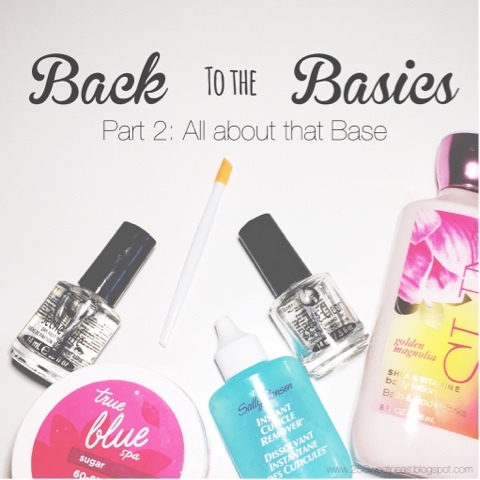 Time for installment #2, which is all about that base! Thank you Meghan Trainor for making everyone start singing when they read that line! Haha! :) What a great way to start a day! So today I want to help you find the right base coat for you! Now I know when you go shopping for a base coat there are just so many options, now the inexpensive ones may look good to you but it may be worth it to splurge a bit for the well being of your nails! First off you should know there are many types of base coat! Not all clear polishes are a good base coat though! The major one you want to have if you want your polish to last is a sticky base coat. Now you may be asking What is a sticky base? and Why Sticky? or Sticky, Eww(said in Jimmy Fallon way of course!). Well any polish is going to adhere better to come thing it can grip to. If you have smooth polish on a smooth base it's more likely to peel/chip sooner. Now you may be thinking Well is that going to make my nails look bumpy? and the answer to that is no. A sticky base is not going to change the appearance of the polish you put on it. Now how to tell the difference in the store. Well honestly there isn't a real good trick or anything, pretty much a test and see on your nail! Now most, I won't say all, since I don't know for sure but most bases that are "strengthening" are a smooth base. Now I'm not saying don't use a strengthening polish, just don't use it and expect it to last all that well with everyday activities! Before I found my current fave I went through SO many different brands to find a good one! 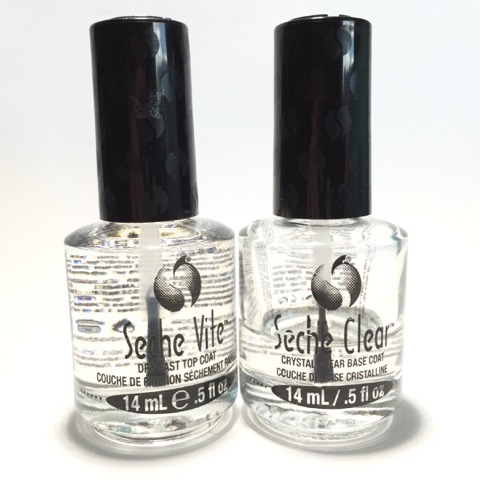 I have now been using Seche Vite for many years and I love it! I use both their base and top and they are wonderful! The base is a sticky base and works great for every thing I do! Another big key factor I may of mentioned in my last post is... Before you put on your base coat be sure to clean your nails with nail polish remover after you have used all of your cuticle oils and scrubs! Your nails need to be 100% clean and oil free!